Info "Where'd that little guy go? Use your torch to find him!" Stage Fright is a microgame found in WarioWare: Smooth Moves, featured in Mona's stage. Its name comes from the term "stage fright", describing someone who is scared to perform in front of a crowd. The purpose of the game is to locate a missing boy with a flashlight. 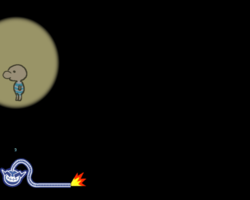 The player must use the Wii Remote as a flashlight to find him. Once succeeded, the boy will put his arms over his head to protect his eyes from the light. 1st level difficulty: The boy is standing still. 2nd level difficulty: The boy is walking slowly. 3rd level difficulty: The boy is running quickly. This page was last edited on May 9, 2018, at 11:39.